Remember to follow the methodical analysis plan from the earlier blog. Firstly – Can you see P- waves? Remember the ‘ready-reckoner’ from case study 4? How to calculate rate quickly? In the example above, there are 11 or 12 complexes, in any run of 30 large squares. Rate is between 11x10 and 12x12 beats per minute. In the absence of P waves, this rhythm is AF (Atrial Fibrillation). Follow AF guidelines. Rate not bad, but consider beta-blocker. BUT if you do nothing else in AF, offer anticoagulation in accordance with CHADS2 or CHADS2Vasc score. This 67yrs lady presented with breathlessness, feeling light headed and just “not myself for a few days doctor”. She has always enjoyed good health and takes no medication. What did you find on examination that led you to arrange this ECG? Comment on the Rate and Rhythm. What is the diagnosis? Remember the methodical analysis instructions on earlier blog. So. This delightful 84yrs old man comes to see you in surgery. Amongst other things, he mentions some chest pains. His symptoms are a bit vague and non- specific. He’s been having them for 6yrs. They don’t sound cardiac, but you know him well, and know he has a history of IHD. He’s not a fit man, but on the other hand, he’s not clinically unwell today. He seems much the same as usual. A long with his known IHD and CKD5, he’s also pretty immobile from his osteoarthritis and obesity. He seems a bit breathless today, as usual. You think this could be anything....! He has a lot of potential problems. You note from his recent annual review blood checks that he has chronic stable anaemia (Hb10.5ish for many yrs) secondary to his CKD. His renal function is stably poor (eGFR is 10-12). Now what shall you do? Are you any the wiser? Lets look at the ECG methodically and see if it helps. All ECG’s can be analysed with a few simple rules. If in doubt, just describe what you see. Comment - Is this a regular or an irregular rhythm? It’s regular. Best seen by studying the QRS complexes in long lead II in this case. If there is no rhythm strip on a 12 lead ECG, you may only have 3 complexes to study. If so, regularity can be very difficult/impossible to determine. Are there any P waves? Are they obvious – or perhaps hidden in other waves, or non-existent? How do they appear (Morphology? Orientation? Size?) Do they have a consistent appearance? Do they have a consistent relationship with the QRS? (Cheats tip: If you’re not sure about seeing complexes – get a repeat ECG with the ‘gain’ increased to magnify the complexes. This is the second ECG I took on this man – you may have noticed the comment on the top right of the ECG: “non Standard lead gain”). On his standard ECG I couldn’t be sure if he had P-waves or not. If there were no P-waves, then this would be a ventricular escape rhythm ie. No atrial activity seen, and the ventricles have helpfully responded by setting up their own pacemaker focus somewhere within them. We can consider their shape. Are they consistent in all leads? What about their orientation? Is there any axis deviation? (A normal QRS complex should be no wider than 1 and half to 2 and half small squares (0.06 – 0.11 seconds). LBBB usually gives rise to a wider QRS complex than RBBB. 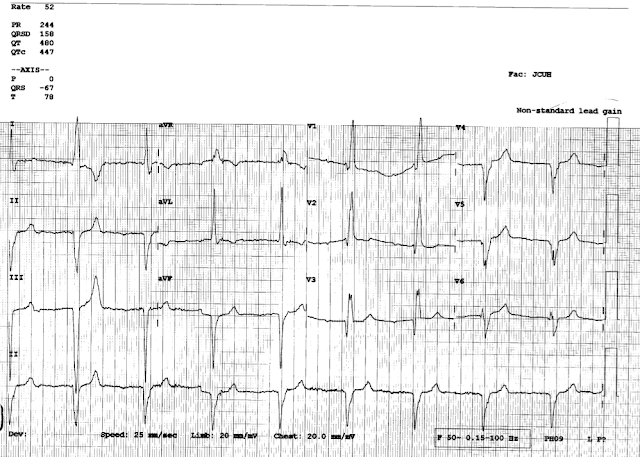 In LBBB, the width of the QRS is > 120ms (MORE than 3 small squares) whereas RBBB is often ≤ 3 small squares. 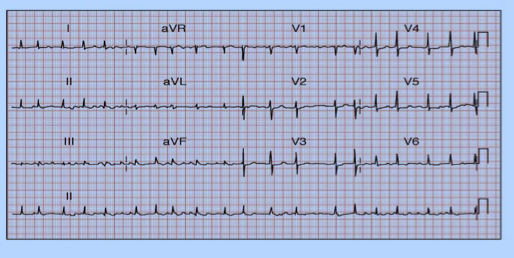 If we go back to the ECG in Case 4, we notice that the QRS complexes are slightly broad, with RBBB formation. NOW WE KNOW, THAT THIS ECG SHOWS A 1ST DEGREE HEART BLOCK, PLUS, A RBBB. A none of these situations apply here, so we know something else must be going on. The Left Bundle branch divides into two – the Anterior fascicle, and the Posterior fascicle. If both fascicles are blocked, then it becomes a full LBBB, but if only one fascicle is blocked, this is known as a “Hemiblock” or “Fasicular” block. So this 84yrs man has a FIRST DEGREE HEART BLOCK, RBBB AND LEFT ANTERIOR HEMIBLOCK. Unsurprisingly, an ECHO revealed severely reduced LV systolic function. He needs a full cardiology assessment and consideration for pacing. Well done those of you who read up to here!